SPRING!!! We made it up to the mid-70's today! Our backyard is still a little damp, but Sean suggested we take them out back to run off energy when he got home from work. 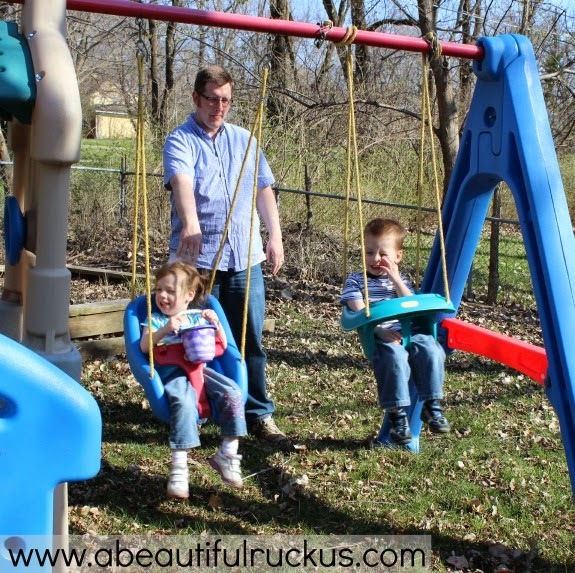 Short sleeves, swings, and spring. Such a beautiful late afternoon to be outside! 2. I Bet You Can't Find Me! 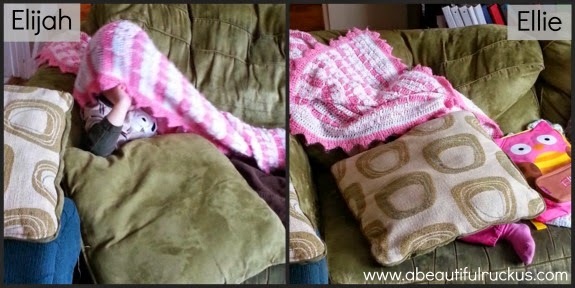 Can you find Elijah and Ellie in these photos? They are expert hiders. We had to look really, REALLY hard to find them. 3. American Girl Catalog...from Preschool? Can you read the note sitting on top of the American Girl catalog in this photo? It says, "Just a little confused. Is the American Girl catalog Elijah's library book for the week? Or did it get into his backpack on accident?" Sean and I have been laughing since Monday about this! Why would our three-year-old son bring home a girls' catalog? Or was this a subtle hint that he wants us to buy him an American girl doll? I sent the catalog back to school with the note attached. His teacher sent a return note (minus the catalog) that the classroom para sent all of the old magazines home with the kids and that was the one that Elijah must have picked out. LOL!!! I have two American Girl dolls from when I was little. Now I'm wondering if I need to dig Kirsten and Samantha out. Every day, I go through the kids' backpacks when they get home from school. Last week, these fell out of Elijah's backpack. "Wha....???" Is anyone missing size 13 men's dress shoes? Because I found them. They've been...customized. Seriously, what do I do with these now? 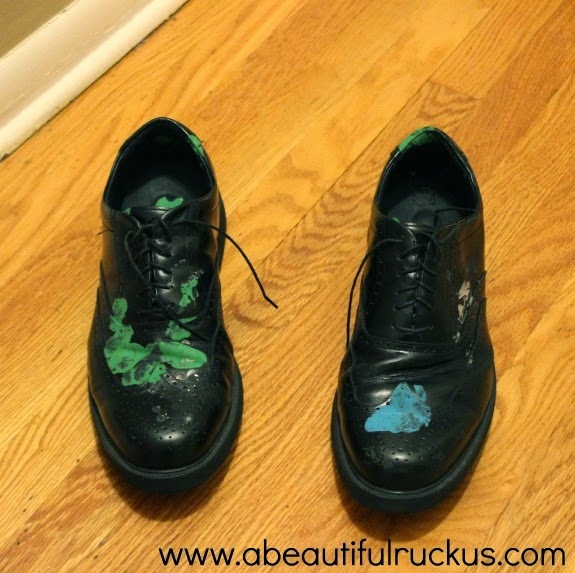 Caleb wears them around the house, but I really wasn't expecting to see two big dress shoes plop out of his bag. This kind of makes me wonder what story I'm going to get to tell about Elijah next week! I wish all of my kids loved veggies and fruits as much as Caleb does. He always, always eats his fruits and veggies first. 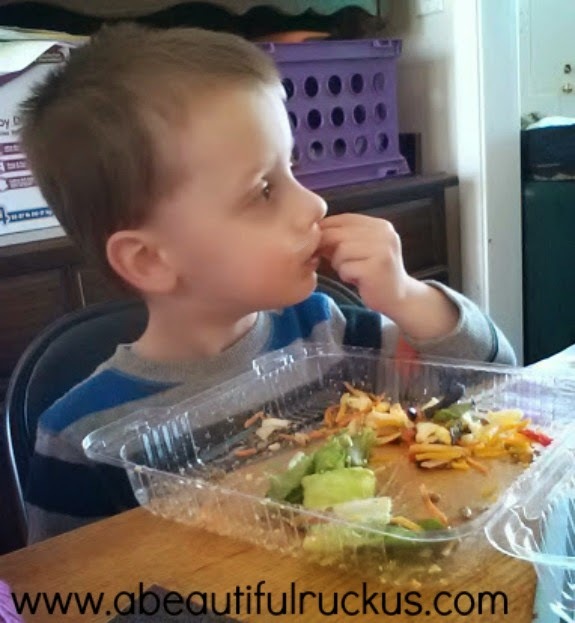 I had a salad today for lunch, and Caleb decided to help himself to my leftovers after he had eaten his food. Keep in mind, I didn't offer it to him. He just really likes his veggies and fruits and wanted some of Mommy's. Keep it up, Big Boy! Abby's teacher sent home an adorable photo of her drinking out of a cup with no lid! I'm so proud of how far Abby is coming. Of course, I couldn't find the photo of her tonight when I needed it for this post. Darn it! 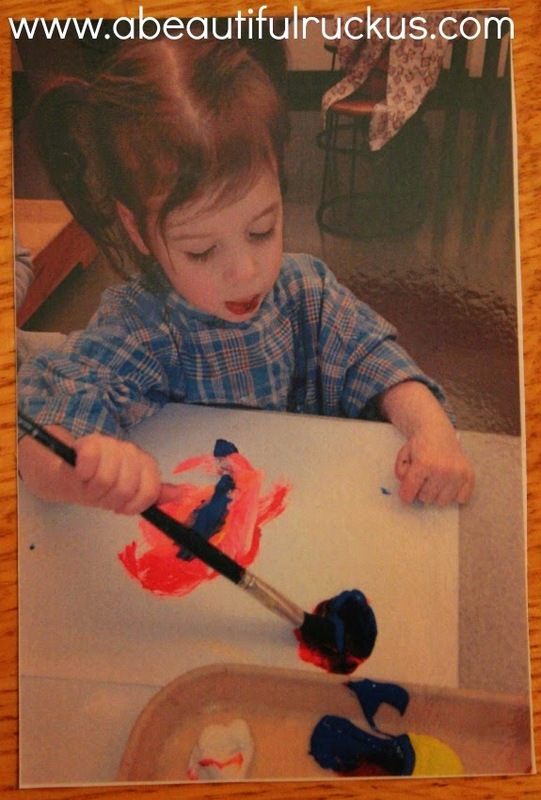 So instead, I'm posting a photo of her painting during her field trip to the Nelson Atkins Museum two weeks ago. This one is still cute even if it isn't exactly the one that I was looking for. 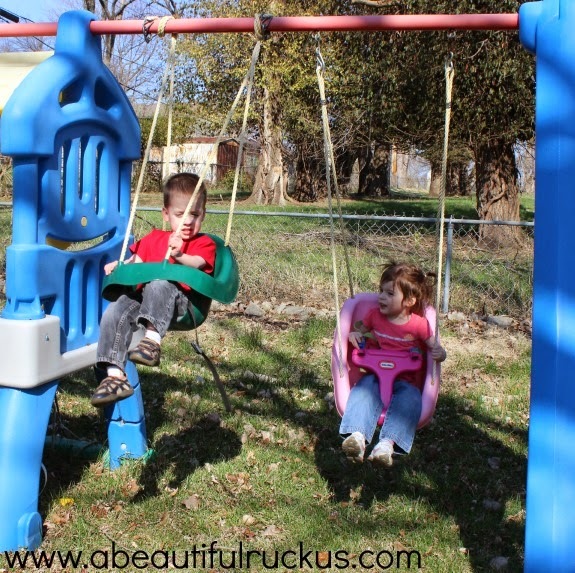 I love the swings! We need to get some for our backyard! HA! The shoes story is cracking me up! !